Sometimes I miss the coding I did last century. Today I was reminded of some of the fun, when I had set my mind to doing some statistics on my blogging. In a blog entry on http://blogs.arno.fi/isit/2009/05/14/home-made-blog-statistics-from-wordpress-mu/ I describe what I did. The blog entry may be of interest for those who use WordPress and are set back by the huge amounts of tables it generates. I happen to host 18 blogs and with each blog requiring 8 tables, that's a total of 144 tables. Add the 9 top-level blogs and I've got 153 tables to navigate. 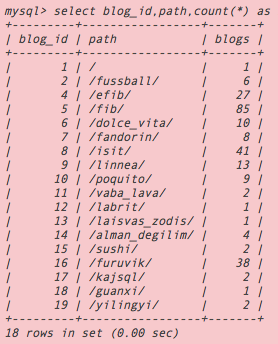 and ends up with some statistics on the 253 blog entries in my WordPress. I also studied the wp_n_comments tables, and came to the conclusion that I'll need to use some global DELETEs to clean up spam comments that have found their way to my site. I found out that, strangely enough, I haven't approved a single comment that includes the character string "viagra"
The same applies to "cialis". but I still have quite a bit of cleaning up to do, since despite deleting first 759 cialis entries and then 411 viagra entries, I still have 3683 unapproved comments to clean up (and I suspect there are less than 10 real comments that have slipped my attention in my inbox, when I've got notification of them). 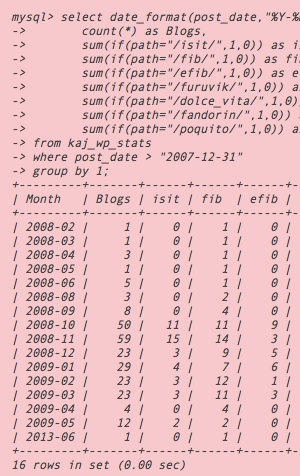 At any rate, I got my statistics and had more efficient and fun (albeit incomplete) spam cleaning than ever before!